And then what? Will there be another parade? When? How soon? 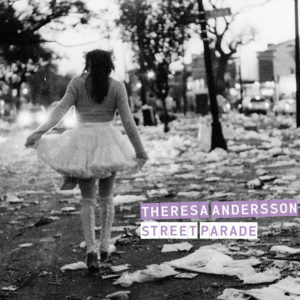 These were questions Theresa Andersson found herself asking amidst the stillness that followed in the wake of one such parade in 2010. She had just returned home to New Orleans, after countless months of touring in support of her 2008 album, Hummingbird, Go!. Now, standing in the empty street, after being unexpectedly lifted aloft by this passing celebration, then set back down just as suddenly, life felt particularly poignant—and full of possibilities. Theresa’s life had not wanted for highs in the years immediately preceding. Hummingbird, Go! garnered accolades from Rolling Stone, Pitchfork, Paste, and the Los Angeles Times. Conan O’Brien and Craig Ferguson showcased her musical abilities on their late night TV shows, and Nic Harcourt picked her KCRW “Morning Becomes Eclectic” in-studio as one of his “Top 10 Live Performances of 2009.” She sang “Ladies In Blue” on Here Lies Love, the 2010 concept album by David Byrne & Fatboy Slim. Allen Toussaint, one of the only outside players on Hummingbird, Go!, joined her onstage for a performance preserved on her recent concert DVD Theresa Andersson: Live at Le Petit. Many artists are paralyzed when the non-stop action of an album cycle or tour winds down, but Andersson felt strangely inspired by not knowing what would come next. Over the past few years, looping pedals and effects had become an integral part of her unique one-woman shows. Now she began using them as composition tools, fashioning songs that would eventually form her new album, Street Parade. She conjured forth melodies and countermelodies, harmonies and rhythms, painting with her own voice as the primary instrument, building up panoramas of sound layer by layer. At first the process moved slowly. Then, in autumn of 2010, there came another momentous, and inspiring, event: Andersson got pregnant. “That’s what allowed all this stuff to come out,” she reveals. “I had been carrying these thoughts and ideas around inside me, but couldn’t really put them together.” With word that a baby was on the way, her creative floodgates opened. As completion of Street Parade drew closer, another big event forced Theresa to linger between stations a while longer. She’d deliberately postponed recording lead vocals until after she’d given birth; trying to reconcile the demands of singing with her final trimester was too physically taxing. But in the days following the arrival of her new daughter, Elsie, Andersson’s voice wouldn’t behave. “I sounded like a 13 year-old boy. It was nuts. We finally figured out that it was hormones.” She had to sit tight just a little longer, until her body readjusted, to finish recording. The final outcome was worth the wait. Opener “Street Parade” hints at the heyday of ’60s sunshine pop in its introductory fanfare, then detours in a more introspective direction that underscores why Rolling Stone likened Andersson to “a spacier, sultrier Feist.” The syncopated rhythms of New Orleans brass bands are reflected in the soft, percussive pulse of “Injuns,” while “Fiya’s Gone” percolates ever-so-slowly, like a Motown classic dipped in molasses. With their innovative combinations of timbres and distinctive harmonic resolutions, “Listen To My Heels” and “Plucks” show how richly her experiments with arrangements paid off. “Making this record and becoming a mother at the same time was very much a life change. Now that it’s completed, I can say that I’ve left my old life behind, but for a long time I didn’t know how it was going to turn out, because I’d never tried to do things this way,” she concludes. Yet in the end, art imitates life. “You just have to know that you’re coming from one place and going to another.” And don’t be afraid to explore the beauty hiding in the spaces in between.